Makers and suppliers of swimming pool paint specialising in paint for swimming pools, pool enclosures, hydrotherapy pools, paddling pools, ornamental ponds and water features. Best choice of swimming pool paint. Best pool paint ever used. We have a variety of paints to be used in swimming pools, swimming pool enclosures, ponds, water features and on surrounding pool areas. Please note we are not painting contractors and do not provide a painting service. Paint for swimming pool maintenance. We manufacture our own range of Chlorinated Rubber Swimming Pool Paint and Acrylic Swimming Pool Paint. 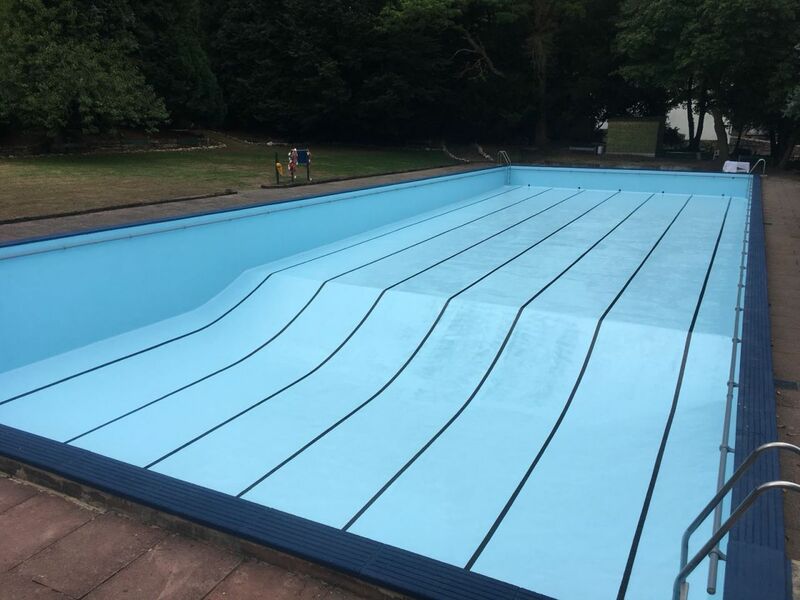 We have White Acrylic Pool paint available "off the shelf" and a range of water based pool paints and chlorinated rubber based coatings for both under and above water. Our Chlorinated Rubber Paint may be used for hydrotherapy pools and spas including canine and equine therapy pools. These animal pools should be regularly cleaned by pressure washing. Non-slip & anti-slip pool paint and high performance multi-surface paints available. A variety of coatings to be used in pools and on pool surrounds, in pool enclosures and on pool ceilings. Smooth, gloss and non-slip paints to treat concrete and metal surfaces along with pools, changing and shower areas. Paint for paddling pools, ornamental ponds, Baptism & Blessing pools and water features. We have a fine, non-slip finish for aluminium pool copings. Water based Contract Grade swimming pool paints now available for budget-sensitive projects. "We would just like to say how delighted we are with your pool paint and your service." "We would just like to say how delighted we are with your pool paint and your service. Our order was shipped to Cyprus - by us - and one tin had spilt in transit. All our responsibility, of course, but you replaced it free of charge, and immediately. Unasked! My husband says it's the best paint he's ever used and we have a very large pool, so it's a big job. Good stuff everyone, and many, many thanks." For advice relating to preparing and painting your indoor or covered pool during the Winter or early Spring months, click HERE. Which paint do I use for my swimming pool? For great advice see the Technical Paint Services guide, HOW TO PAINT A SWIMMING POOL inc TROUBLESHOOTING. A high quality synthetic, anti-slip alkyd floor finish suitable for interior or exterior use. Lead free. Grey and Red Oxide. Floor paint for internal and external use. GREAT VALUE PRICE! Coverage: 40 sq metres per 5.0 Litres per coat @ 25 microns dry film thickness. Chlorinated Rubber Solvent Based Swimming Pool Paint. A fast drying, Chlorinated Rubber finish paint, suitable for painting inside swimming pools, concrete ponds, hydrotherapy pools and spas. Waterproof when applied correctly. BS4800 & RAL colours available, suitable for pools, fountains and water features. For pool steps, please see A148NS. Strictly Net Price. Coverage: Up to 40 sq metres per 5.0 Litres per coat. A fast drying, Chlorinated Rubber anti-slip finish ideally suited for steps and walkways in and around swimming pools. Solvent based. A fine non-slip texture is available. Coverage: 30 - 35 sq metres per 5.0 Litres per coat. For the FOURTH year running, despite increases in the cost of our materials, we have managed to hold the price of WB148 Swimming Pool Paint in standard colours. Water based 100% pure Acrylic Swimming Pool Paint, suitable for application to all types of porous substrates and other pool coatings, but not suitable for application over two pack epoxy. Ideal for swimming pool maintenance. Fine anti-slip texture is available. Strictly Net Price. Availability: WB148 Acrylic Swimming Pool Paint, 5.0 Litre containers in a choice of our most popular colours. Other colours, minimum 10.0 Litres. Available from stock and delivered within 2 working days. Water based 100% pure Textured Acrylic Swimming Pool Paint, suitable for application to all types of porous substrates and other pool coatings, but not suitable for application over two pack epoxy. Ideal for swimming pool maintenance. Fine anti-slip texture is available. Strictly Net Price. Availability: WB148 Textured Acrylic Swimming Pool Paint, in a choice of colours. Available from stock and delivered within 2 working days. Acid Wash Cleaner (Hydrochloric or Muriatic Acid). Recommended for use before re-painting your pool. This powerful acid based cleaner is designed as a pre-treatment to promote and help clean concrete, stone surfaces and old painted surfaces. It should be used to remove calcium scale, chemical residue, body fats, suntan oils and other surface contaminates on the pool surfaces and surrounding areas. Available from stock. Our Price: £16.95 (Exc VAT) per 5.0 Litres. Chemical and urine resistant Chlorinated Rubber Floor Paint. A fast drying, single pack floor finish which has excellent resistance to a wide range of chemicals. Can be used for veterinary clinics, milking parlours, stables, kennels and catteries. BS4800 colours, minimum 5.0 Litres. RAL colours, minimum 10.0 Litres. Coverage: 40 - 50 sq metres per 5.0 Litres @ 25 microns dry film thickness. Anti-Slip Chlorinated Rubber Floor Paint. A fast drying, single pack non-slip floor finish which has excellent resistance to a wide range of chemicals. Urine and faeces resistant paint, ideal for veterinary clinics, kennels, stables, horse boxes, trailers etc. Floor paint for internal and external use. BS4800 & RAL Colours. A choice of Fine or Medium non-slip texture is available. Anti-glare heat reducing paint for glass, polycarbonate or Perspex. A translucent coating designed to reduce the intensity of sunlight transmitted through glass, polycarbonate or Perspex windows and roofs. Provides up to 80% of UVA & UVB ray reduction. White & Green. Our Price: £62.00 (Exc VAT) per 5.0 Litres (subject to minimum batch mixes). Coverage: Approximately 60 - 70 sq metres per 5.0 Litres per coat. Anti-glare heat reducing shading paint. A translucent water based coating designed to reduce the intensity of sunlight transmitted through glass, polycarbonate or Perspex windows and roofs. Provides up to 80% of UVA & UVB ray reduction, reduces solar gain and greenhouse effects. Water Based Off-White & Green, (subject to minimum batch mixes). For external use only. Our Price: £49.00 (Exc VAT) per 5.0 Litres. *UK Mainland only, while stocks last. Solar Reflective spirit based roof paint. A fast drying, spirit based solar reflecting white finish paint. Finish suitable for application to tarmac, concrete, asphalt, polycarbonate and glass. Coverage: 30 - 40 sq metres per 5.0 Litres.